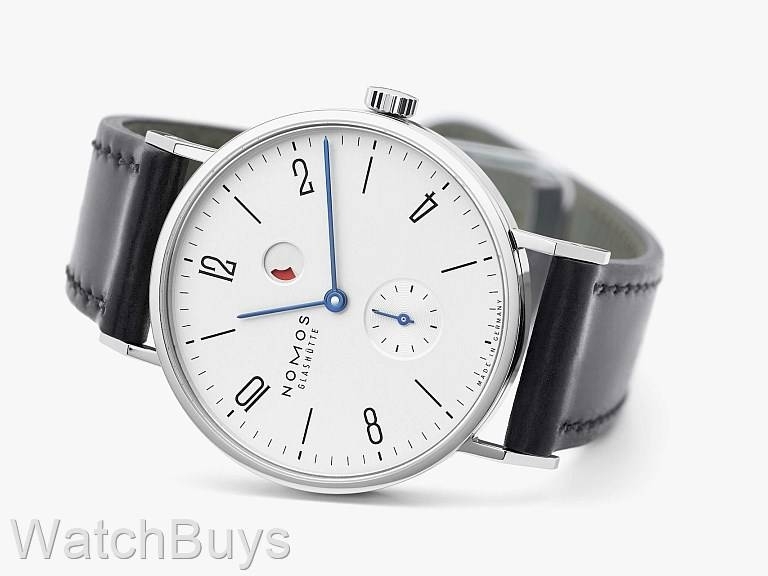 The Nomos Tangente Power Reserve features a power reserve module designed and finished in house, and is a very unusual power reserve display. On most watches, the power reserve is indicated by a hand pointing to "Low" or "Full", similar in function to that of a car gas gauge. 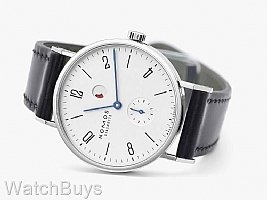 The Nomos power reserve shows the amount of wind remaining in the watch through a circular opening in the dial between 12 and 1. When the watch is fully wound, this opening will show no color at all. As the watch winds down, a red display begins to appear, increasing in size to completely red as the power depletes, as in our photograph above. This watch is extremely comfortable to wear thanks to its uniquely designed lugs. Be sure to expand the picture above, and you will be able to see the curved pattern in the lugs which causes the watch to mold to the wrist, and creates a length of 45 mm lug end to lug end. Verified Owner Comments: The Overall beauty of this watch is in its simplicty. I have recived several unprovoked comments from stangers, as well as friends, who have said that it was one of the best watches they had ever seen.